Leah Chavez and Gabe Chavez are the owners of Peaceful Pet Sitters in Santa Fe, NM. I was inspired to create Peaceful Pet Sitters while working at the Santa Fe Animal Shelter & Humane Society in 2010. Two of the most common concerns pet parents have, are working long hours or frequent travel. Quickly we had a booming business and I needed help. At the time my husband Gabe was working in the finical services industry and decided to join Peaceful Pet Sitters. Shortly after Peaceful Pet Sitters was one of 12 Santa Fe start up business selected to participate in a business accelerator called the Velocity Project. The exposure was great and we quickly became one of the largest pet sitting companies in Santa Fe. Gabe and I are so honored to care for Santa Fe's wonderful pets and love what we do. I was raised by entrepreneurial parents and have always wanted to own my own business. The big question was, “What kind of business should I open?” I have extensive experience working with various types of animals, such as dogs, cats, small animals, farm animals, horses, reptiles, freshwater aquariums, and birds. My pet-care work experience includes grooming salons, doggie day-care centers, managing retail pet stores, and rescue/adoption organizations. Over the years I have always found myself working with animals in some capacity. I’ve had more than 25 years of animal husbandry experience, so founding a pet-care company was a natural choice. In 2014 I was so honored to be awarded Young Professional of the Year in the Sate of New Mexico by the Professional Business Women of New Mexico. I love to inspire other young women and girls to follow their dreams and not always follow traditional paths. I look forward to serving you and your furry family soon. I joined my wife Leah at Peaceful Pet Sitters in October, 2013. Since joining the company full-time, I have loved working with all types of animals. 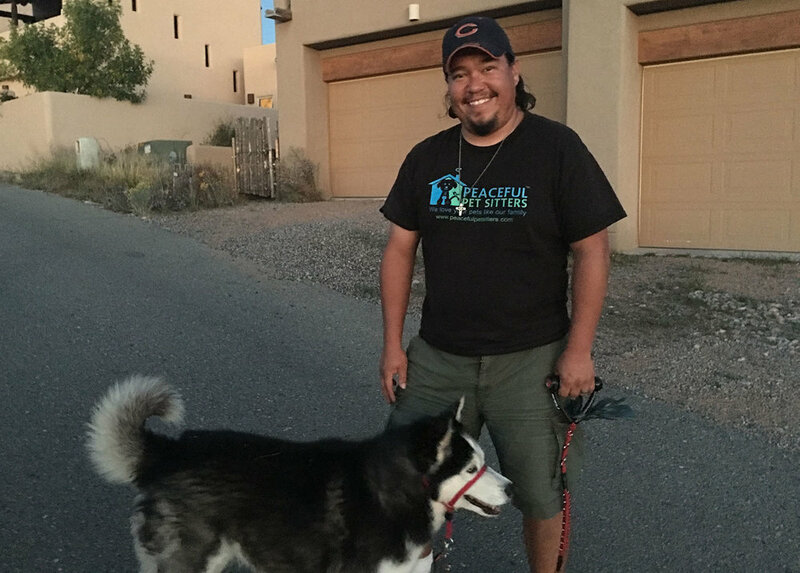 Walking dogs on a daily basis has been quite rewarding as I have had the opportunity to work closely with local dog trainers to learn more and more about dog behavior. I am grateful that I have the opportunity to care for Santa Fe’s pets. When I'm not walking dogs and taking care of cats I usually have a musical instrument in my hand. I currently play 8 different instruments ranging from piano to classical guitar. You may find me around town playing professionally with Mariachi Sonidos Del Monte. I love to share music with the animals under my care and find that it helps them relax.